I am thinking... about science. I am thankful for... everyone healthy, Kerry has a bit of work, and we got through the first half of Monday without any whining. I am praying for... my brother and his job interview Wednesday, friends (and strangers) in Japan, and attitudes around the house. I am creating... dinner for a sick friend. I am going... to break early for lunch today. I am reading... Whatever Happened to Penny Candy? by Richard Maybury. From the learning rooms... parentheses in algebra, experimental probability (Tate), and the commutative property (Gunnar), words with curr/cour/curs, Mao's rise to power in China, apartheid in South Africa, experiments with light, writing Limericks, and talking about courteous speech. From the kitchen... grilled lime chicken with rice tonight. Around the house... I just tidied and where did all these books come from??? Noticing that... we all seem to be dragging today. Why so tired? I recently asked my friends' little girl what she wanted to be when she grew up. Both of her parents, liberal Democrats, were standing there, so I asked her, "If you were a President, what would be the first thing you would do?" She replied, "I'd give food and houses to all the homeless people." Her parents beamed. "Wow, that's a worthy goal," I told her. "But you don't have to wait until you're President to do that. You can come over to my house and mow the lawn, pull weeds, and rake my yard, and I'll pay you $50. Then I'll take you over to the grocery store where the homeless guy hangs out, and you can give him the $50 to use toward food and a new house." One of my favorite things... hot chocolate. A few plans for the rest of the week... Tate's Hunter Safety course starts tonight and he is really excited! Otherwise... school work and errands. Thrilling times, yah? Found this in the school room one morning, from Tate. Anyone remember Harold and the Purple Crayon? I like that story - could be applicable here, without the party references! the story isn't mine! It's been passed around a lot and I don't know the origin - only that it isn't mine! I'm totally going to steal that story and claim credit for it too! Muah ha ha! I used to love teaching Limericks. Do you have a track worn around your house? I think your boys could teach Squirt a thing or two. That girl has so much energy! Supper sounds delicious! I do remember Harold and the purple crayon. 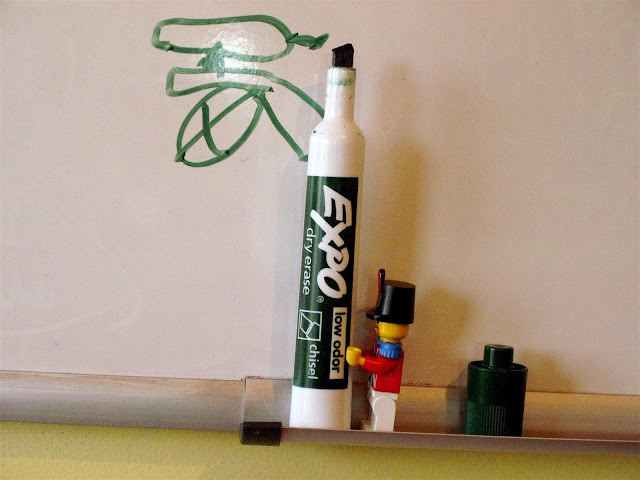 I love the Lego guy writing on the white board, lol! The story made me laugh. Love it! Tired with you. Here it's the desperate need for sunshine, I think.